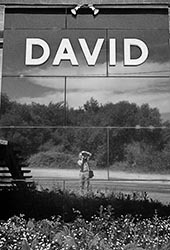 photo: 'David'- the company name on a glass fronted factory in Normandy. I'm a photographer based in Dorset, England. The black and white image has more relevance to me, so I shoot monochrome as I prefer it's graphic nature and greater distance from reality. I have returned to using film, but not to the 'wet darkroom' as I relish the control that digital post production provides and using Jone Cone's 'Piezography' inks I am able to make superb monochrome prints that exceed the quality of any darkroom silver prints I could ever make. I started photographing as a teenager when living in Singapore. I was able to photograph the aircraft that were based at, or visited the RAF station we lived at, however I soon got frustrated with the poor results I was getting. This was because of the sub-standard processing my negatives received and my father encouraged me to start developing and printing at home. My photography continued when I began working in television sound, a career which started at Anglia TV in 1966. However through my years in the 70's at London Weekend Television and at the independent studio Limehouse in the early '80s, my work and family life had to take precedence so I stopped serious photography. I entered a period of freelance TV mixing in the mid 1980's and then ran my own TV sound post production suite from 1996 until 2010. After my children left home I returned to photography with a digital camera but the real thrill of photography was finally rejuvenated by returning to using a Hasselblad film camera. It feels like 'picture making' again and not using a computer. My greatest influence would be Michael Kenna. He photographs at the times of day, or more often night, when other photographers put their cameras away and I find the simple beauty of his 'minimal' images very compelling. Photography is about 'what you leave out'. Over the last few years I have returned to my earliest aircraft images and have now printed many of these and put them, along with some from my travels on this website. The more I delve into my old negatives the more I enjoy them so I hope others find the images I took years ago pleasing.